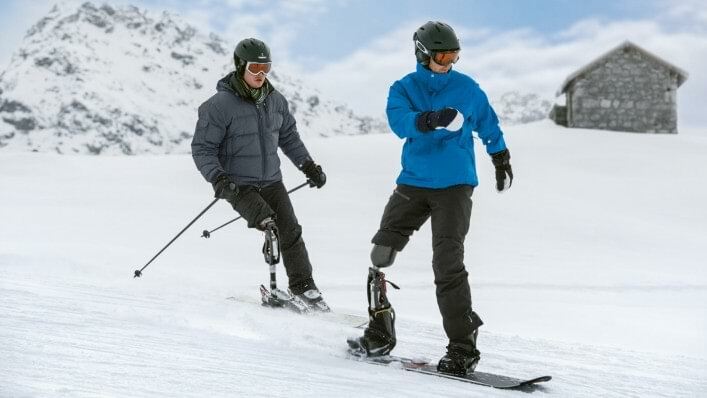 The ProCarve System is a sports prosthesis system for skiing and snowboarding or other sports with similar motions such as waterskiing or wakeboarding. It is the most functionall mature system on the market and applicable for recreational as well as professional sports with knee disarticulation, above- or below knee amputation. Sign up here to learn more about ProCarve! ProCarve foot can be easily and directly attached to the ski binding. The foot shell offers a proper fit to the snowboard boot. Disengagement system allows user to adopt a sitting position easily. Blocking clip and soles for improved walking. Can be used for different sports. Flexion and extension damping can be individually adjusted by the technician. Less noticeable using ProCarve rather than using a mono-ski.